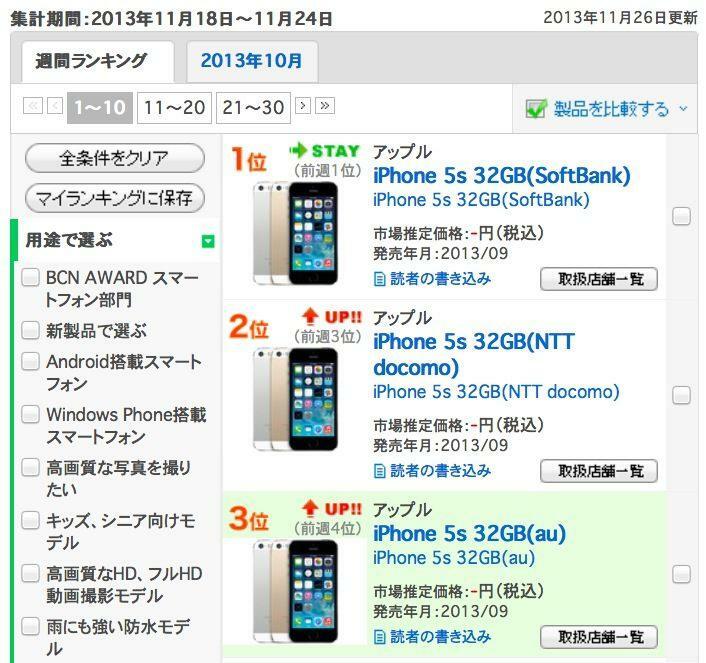 Weekly sales rankings by Japan's BCN list Softbank's 32GB iPhone 5s as the nation's the top seller, with the same model on NTT DoCoMo and au/KDDI filling out the top three. 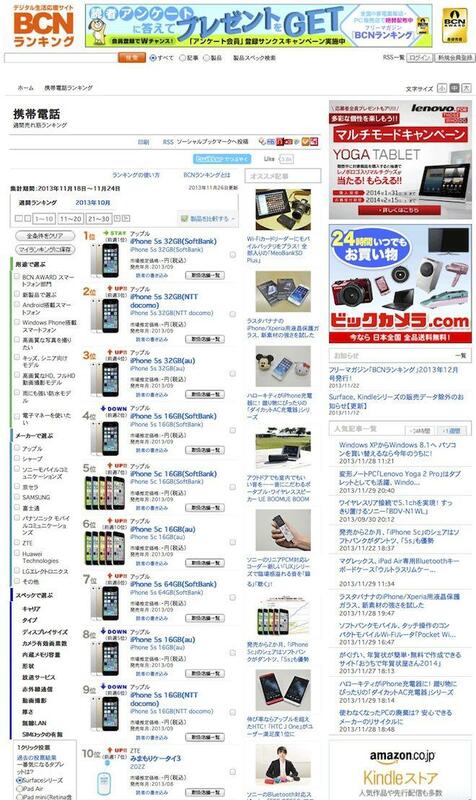 iPhone 5c on Softbank and au took the fifth and sixth spots, while the second place DoCoMo phone was the high end 64GB iPhone 5s. The top selling smartphone not from Apple wasn't a domestic branded smartphone or a Samsung model but rather a low end Chinese device by ZTE. Sony represented two models in the top 20, while the top selling Samsung device was a Galaxy S4 at 16th, behind two additional iPhone models: 64GB versions of iPhone 5s on au and NTT DoCoMo. In total, Apple took 12 of the top 20 slots compared to just one Samsung device. Prior to launching iPhone 5s and 5c in September, NTT DoCoMo had been pushing Android phones from Sony and Samsung in an effort to resist Apple's refusal to allow preinstalled apps or carrier branding on its iPhones. Two years ago, Chief Executive Ryuji Yamada defended his refusal to carry iPhones using the same logic Wired presented two years before that: the lack of built in support for popular features like iMode messaging and digital wallet systems. After losing 3.2 million users over the last 4 and a half years by not carrying the iPhone, NTT DoCoMo finally relented and began carrying Apple's smartphone this fall. The majority of the carrier's sales immediately went to iPhones, mirroring a virtually identical story at Verizon Wireless in the U.S.
Verizon spent two years backing BlackBerry's attempts to provide an iPhone-alternative with two failed generations of the Storm, then orchestrated an intense effort to position Android as its "Droid" branded alternative to iPhone in 2010. Despite offering 4G LTE service, Verizon's Droid program failed to attract the high value data subscribers AT&T was attracting with iPhones. 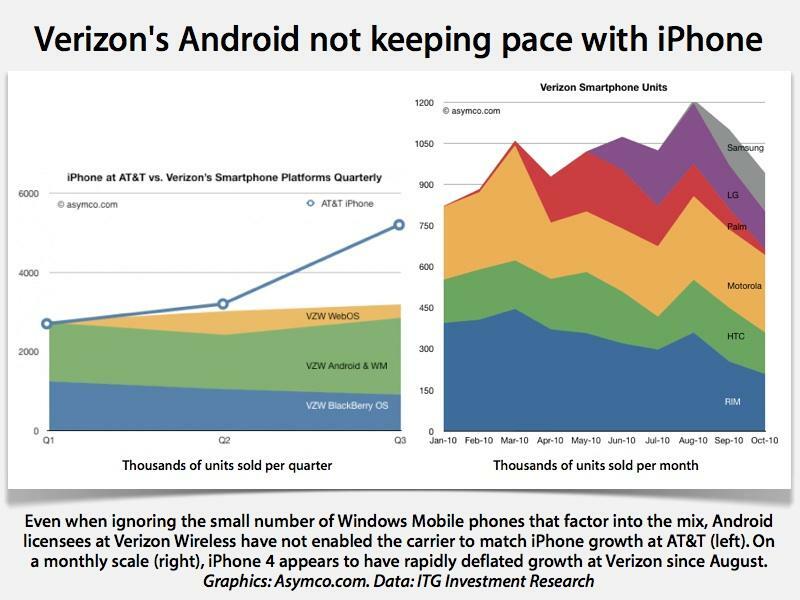 After launching iPhone 4 in 2011, Verizon reported the 3G model outselling all of its Android 4G sales combined. Just as Motorola had partnered with Verizon in 2010 in an attempt to gain a footing on a carrier without iPhones, Samsung had attempted to partner with NTT DoCoMo to "improve its brand image in Japan," stated Sumio Hiroshi, a manager at Canon in Japan. While special incentives and promotions helped Samsung to push volume smartphone sales on NTT DoCoMo this summer, just as Motorola had apparent success in selling phones on Verizon in 2010, its popularity was short lived when it was exposed to competition from Apple's iPhone. Complicating Samsung's efforts to sell phones to Japan is an unfavorable view of South Korea related to a territorial dispute over islands located between the two nations, a squabble that has been escalating for years.